Selected to be represented by Bristol Contemporary Art following The Other Art Fair. 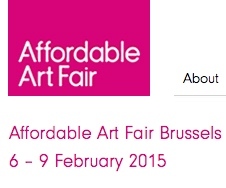 My work will be joining them on Stand E5 at the Affordable Art Fair Brussels, the 6th- 9th February 2015. It is extremely exciting to be being taken to this very established Fair with a new gallery and starts the new year off very well. I will be popping over to visit the Fair and will document the stand and post images online. Newer Post Hello Brussels! Bruxelles Bonjour! Goeiendag Brussel! Older Post Up and Down Safely!